The real beauty of the F-One set up is the Fast Connection Device or “FCD” as they call it. In previous years this meant there were only 3 bolts to do up in order to build the entire set up and that included attaching it to the board. For 2017 they have made the rear wing two pieces rather than one resulting in a total of 5 bolts to deal with. However, it’s not only the speed of build that makes the FCD great, it is the fact it keeps the wings, fuselage and mast in perfect alignment too. One previous disadvantage of the F-One system was that it was only available in carbon therefore prohibitively expensive for some people. The Hybrid in the name means the set up is now a mix of carbon and aluminum at a great price. You get full carbon front and rear wings plus a carbon fuselage with an aluminum mast. This combination keeps the weight down and the performance level high while hugely reducing costs. F-One offers two boards in their standard glass construction, the 49 and the 51, which we have on test here. You can also get a 45, 47 and 49 in race carbon trim, although for a first time foiler we would definitely recommend the 51 as a starting point. The numbers relate to the width of the board, and a bigger board with more volume will ensure you have a more stable platform for learning. They also offer a new 51 TS board, which uses an injection molded construction technique offering even better value for money to get you started. The construction on this set up really is second to none, the carbon wings are beautiful and the entire way the system just slots together with ease is a testament to the care and attention paid in the factory. The overall combination is light too, the carbon wings help to reduce the overall weight. The entire foil line up is interchangeable, hence the removable back wing, so once you have a mast and fuselage you can then bolt-on any set up you desire. As you improve you can just get smaller, faster wings and progress even further. The 51 cm wide board with this set up makes for those first rides really east, there is plenty of volume underfoot to float you when you are not on the foil and that is really important. When you learn this crazy new discipline you’ll be spending a lot of time on the board on the water and having that float and volume makes learning so much easier, especially when tackling your first tacks and gybes. The foil itself is really stable once you are up to speed and riding on it, the mast also offers excellent stiffness and plenty of upwind drive. We tested this back to back with the 2016 set up and while it’s not as fast as the 600 Freeride wing, the upwind angle is very impressive. If you’ve never ridden a foil before you might find the initial runs on this board a bit of a challenge, however once you have mastered it then you’ll have plenty of performance in your pocket to progress for a good while. If you are a total beginner then perhaps consider the F-One 90/1000 set up which offers a slightly larger front wing with a different profile to encourage foiling at slower speeds. If you can get a couple of lessons on a true beginner foil and then get yourself on this set up though you shouldn’t have too many issues. In terms of build and quality this is one of the best set ups we have seen, we love the Fast Connection Device and KF Box connection system. It is so easy to use and quick too. The board is well made and works really well and as an entry to intermediate level set up this fits the bill perfectly. Well priced and dripping with carbon we are huge fans of the freeride 90/800 Hybrid Kitefoil! 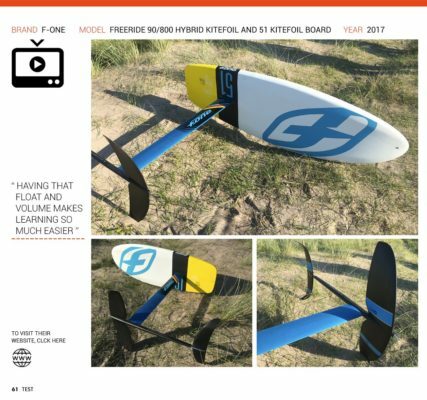 Lear more about the 2017 F-One 90/800 Hybrid Kitefoil !